The Portuguese Register of Toxicologists provides professional recognition for toxicologists with suitable qualifications and experience. The attainment of registration is seen as a significant milestone in a career in toxicology and is increasingly desirable for career progression. The designation “Registered Toxicologist” is not lightly given and has to be maintained by annual Continuing Professional Development (CPD) and regular review of continuing education and practice in toxicology. The National Register was launched in 2014 and is co-organised by the Portuguese Society of Pharmacology (SPF) and the Portuguese Toxicology Association (AP Tox). It is part of the European Register of Toxicologists. Since 2015, Members of the Portuguese Register of Toxicologists gain automatic membership of the EUROTOX Register of Toxicologists and are entitled to use ERT as a post nominal. Applications to the Portuguese Register of Toxicologists are open to experienced scientists engaged in the field of toxicology that are members of SPF and/or AP Tox. 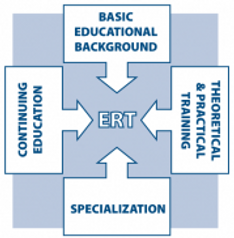 ERT are required to have an acceptable education leading to an appropriate qualification together with an additional training to achieve the necessary competence to practice their profession. Inclusion in the Portuguese Register of Toxicologists applies for a period of 5 years after which re registration is required. Applications up to the 31st of October 2019 will be considered in the next evaluation process.